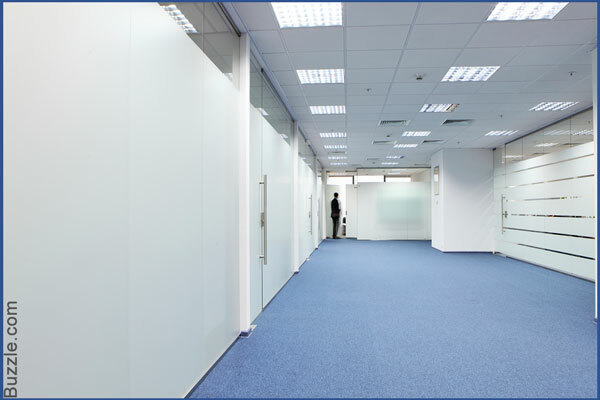 Most people treat their offices as extremely professional spaces that lack color and border on a boring look. 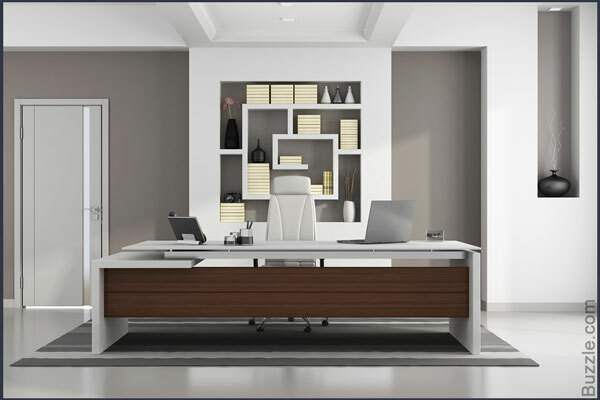 Breaking this barrier and mindset, help yourselves create a great look for your office so that it is bright, professional, and gets work done! In coloring your personal room or any room in the house, you can think of any type of color as per your preferences. But some people believe that when it comes to choosing paint colors for a workplace, you need to consider some important points. They believe that an office is meant to be a place for business dealings; therefore, it certainly has to have a professional touch. However, this does not mean that you cannot go a little quirky with your choice of colors. An office can look professional in spite of having vibrant colors, and in fact, vibrancy is what encourages employees to get creative and productive. 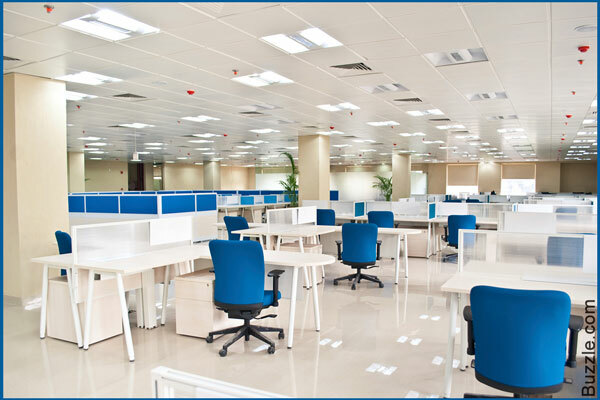 Here's a look into how you can go about achieving vibrancy and that spark in your office without compromising on the necessary professionalism such a space demands. 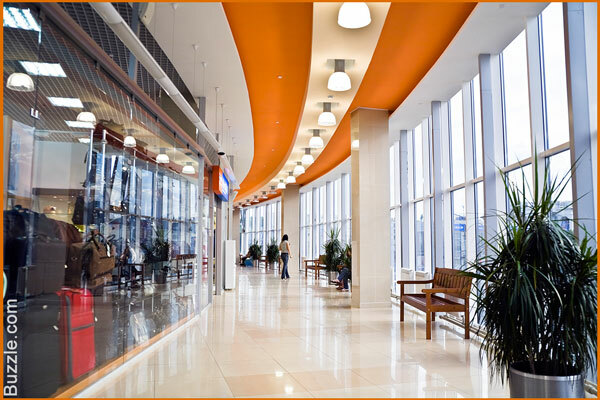 Here, we have classified office paint colors on the basis of the areas that comprise an office. While it is expected that the entire office follows one particular color or theme, this is a choice that is completely personal. If you wish, every area in your office that is separated by a partition/wall can look completely different. Take a look at some of these ideas, and you will be able to better decide how you want your office to look. 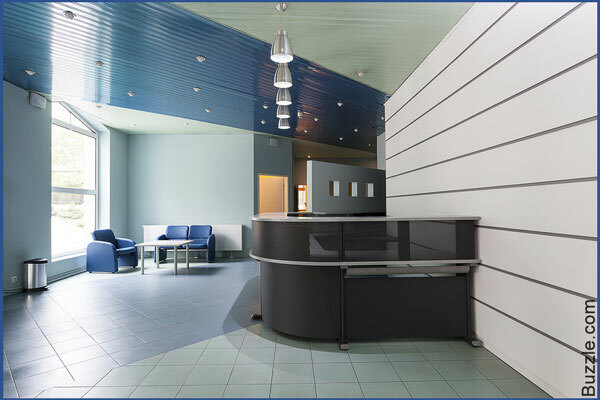 The office reception gives any visitor an overview of what to expect from the office. It sets the tone of formality in the office. 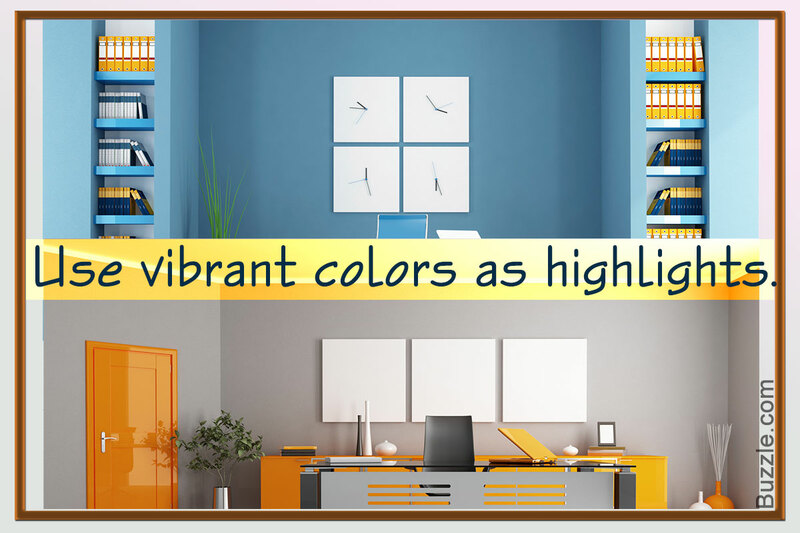 So how you want to showcase your office to outsiders can be done by choosing the appropriate colors. For instance, in the first image showcased above, the colors red and black are suitably formal, though the red twang slightly tones down the level of formality of the area. On the other hand, the second image is a completely vibrant space, with its colorful furniture. For an office where creativity forms the basis of the profession, this combination of paint colors may look simply perfect. Leading you from one area of the office to another, passages or corridors also have a vital role to play when you want to decide what paint color to choose for them. If you have large spans as shown in the first image above, light colors such as a beautiful light leaf green can be used. If you want to use brighter colors such as red, orange or the like, use them for shorter spans to give the entire passage a pop of color, as shown in the second image. Whether you use your conference room to brainstorm, discuss targets or conduct board meetings, no one has said that it has to be extremely formal for it to create the mood. I always think lighter and brighter colors lighten a somber mood and calm the environment. Just like the red and black reception, the red and black conference room also strikes the perfect balance between vibrancy and formality. Similarly, the conference room with the orange ceiling gives a dash of color in an otherwise boring room. 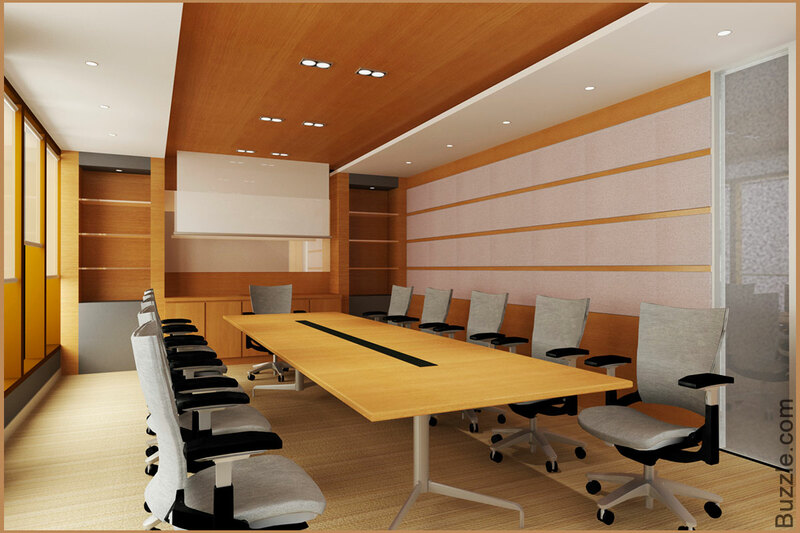 Because it is only the ceiling, you can easily keep switching the look of the conference room to suit your taste. Okay, so you really are not into vibrant colors and want a more traditionally professional look for your office/cabin. 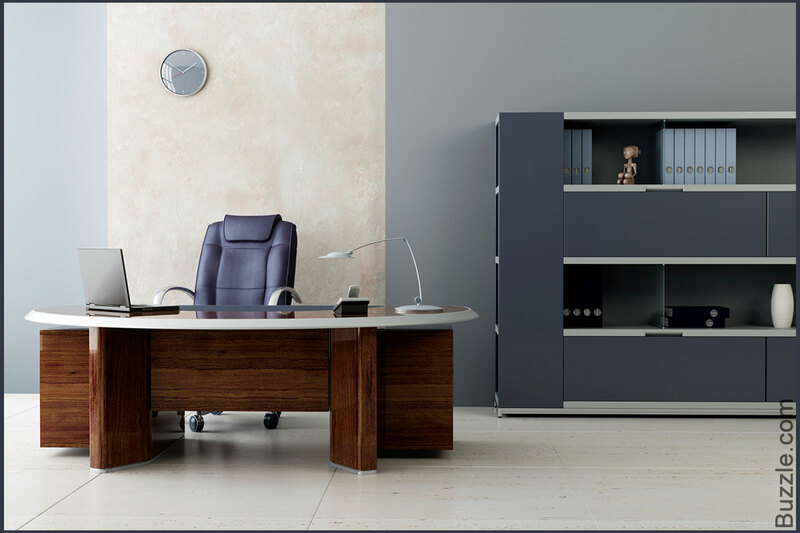 The gray cabin above is a perfect example of classic office interiors and is sure to suit your taste if you aren't someone who likes a burst of colors around all the time. 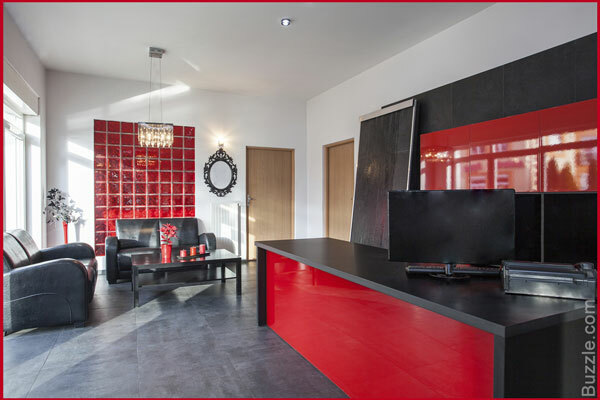 On the other hand, while the second image is also quite professional with its white paint, the red chairs give the room the necessary color. The idea is to keep the backdrop simple and add color with the help of furniture of accessories. That way it becomes easier to introduce change without compromising on the overall professional look you desire. For a sleek, corporate look, try going with a black and white look with pops of light sea green in the common work area. Green is known to be a refreshing color, so it is likely that it will calm your employees' senses and get them to work without muddling up. On the other hand, the light orange ceiling lends energy to the common work area, and gets the employees to handle every task at hand with the right frame of mind. Depending on the general mood of your work force and the nature of your profession, you may choose between these or similar colors. For those of you who are not convinced with the aforementioned ideas and would like the traditional profession-based paint colors for your office, here are some tips that will help you choose those classic office colors and lend your office the professional look and environment you wish to create. If you intend to make the office look bigger, it is suggested that you go in for bright and light colors. 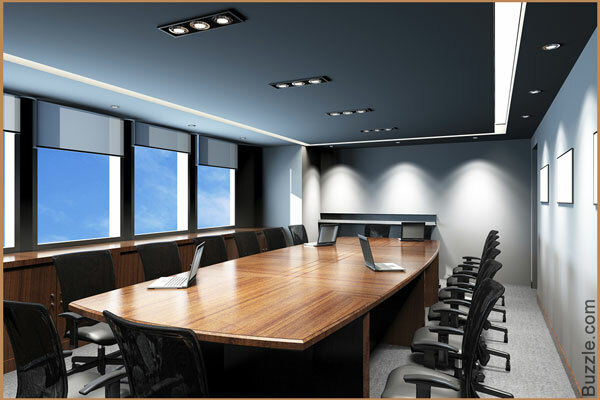 A white ceiling will also contribute toward making the office appear larger. If you have a substantial amount of office space, you can choose warmer or slightly dark colors. Determine what type of employees will be working in your office; for e.g. lawyers, accountants, writers, engineers, etc. 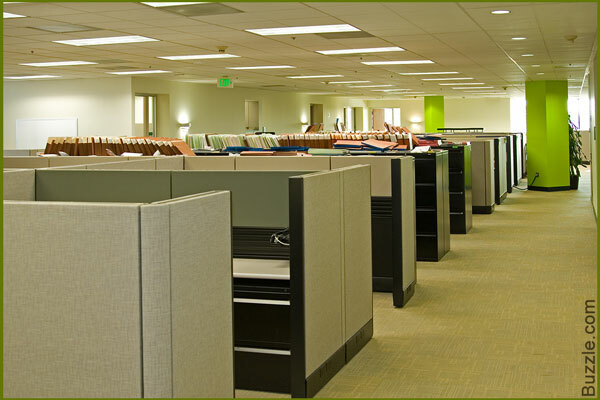 The colors which better suit your office will also depend on the kind of employees that are employed. Choose colors that you think will enhance their productivity and take their personal preferences into account when choosing a color. If your office mostly comprises creative professionals like designers or writers, bright colors shades such as orange, red, or yellow are ideal. If your office employs busy professionals like lawyers or accountants that are likely to get stressed during the work, cool colors such as blue and green are most appropriate. How much lighting your office gets also has an impact on which colors would be suitable for it. If it receives a significant amount of natural light, you should not choose bright colors, as they would seem too bright. If the office receives a little amount of light, only then you can choose bright color shades. Go to your nearby paint store and obtain color swatches and palettes. Choose the color combination that you think will look good on the walls. For instance, if yours is a graphic design or advertising firm, the walls can be painted with different patterns and color combination. Always envision a complete look with furniture, accessories and paint and then decide the colors you want to go for. A combination of too many colors can look as disastrous as the lack of a suitable amount. These are some tips on choosing ideal paint colors for your office. You can surely choose from a wide variety of colors, but just ensure that you and your work force are comfortable in whatever setting you choose.